Our original plan with our new house was to start off with kitchen and living room updates, but we quickly decided to lump the half bathroom into that as well. Like our kitchen, the half bath was fully covered in a dark burgundy paisley wallpaper, complete with a coordinating border. 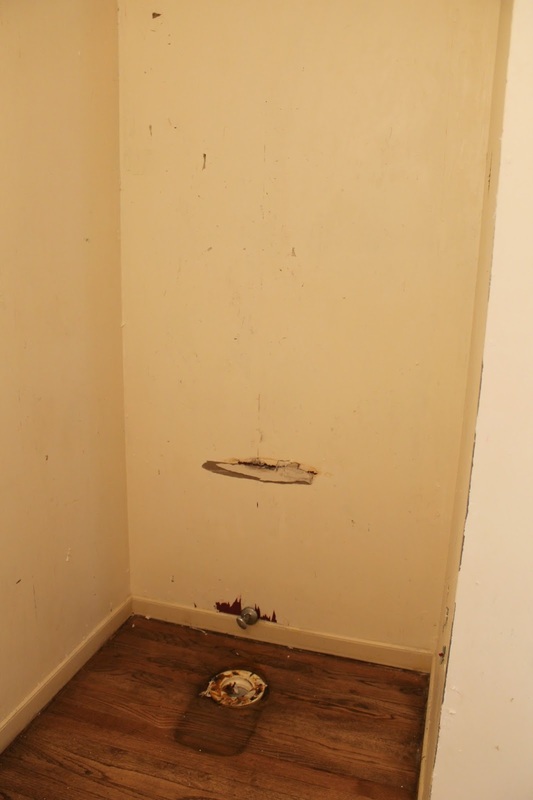 We decided that while were paying someone to remove the wallpaper in our kitchen, it would be cheaper in the long run to go ahead and take care of the bathroom, too. The goal was to spend less than $500 total on the room. Luckily, there was already a gold mirror in there, which will save us a couple hundred bucks. We picked out an inexpensive vanity from Lowes this week that was on sale for $189, and I bought a chrome faucet ($54) and light fixture ($27) to go along with it. Since the existing mirror is gold, we'll have a few other gold accents in the room to tie it all together. I'm so happy that I get to use Sea Salt in one of our rooms, I think it's such a gorgeous color and perfect for a powder room. If all goes to plan, we'll spend about $350 on everything including the cost of paint, which leaves another $150 for all the other little extra things that I'll need (towel bar, rug, things to put on the walls, etc). Can't wait to see this all come together! Just to see where we're coming from, here are a few pictures of the half bath as it is now. 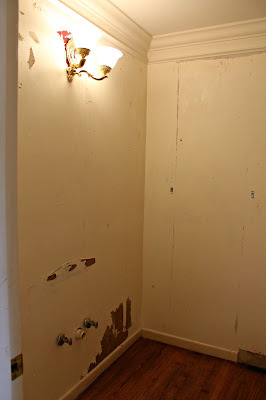 Wallpaper has been removed as well as the toilet and 90's seashell pedestal sink. Nothing too exciting, but I do love the thick crown molding. It's really the only part of the room we're keeping. We should have everything painted and installed by early to mid next week. Stay tuned for an update. Love Sea Salt - I have it in my kitchen and I am so happy with it!